International calls can be extremely expensive. Thankfully, there are many apps that let you create a free US number, then use it to make and receive calls via Wi-Fi or cellular data. 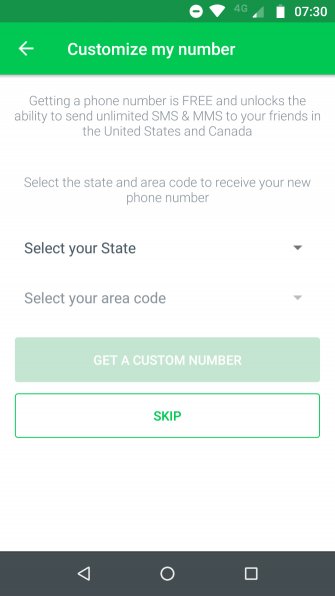 Each of these apps assigns you a free phone number (in the US) that you can use to call or text any other American number, and it will behave like you are in the US. They will not use your cell minutes or SMS text messages. Here are the best free calling apps for Android and iOS. Talkatone has been around for a while and is one of the most well-known real calling apps on this list. It’s gone through a lot of changes over the years, but now it offers unlimited free calls and texts to any number within the US and Canada. You can buy also credits to make international calls; those rates vary. It’s packed full of features such as custom voicemail greetings, passcode protection (so no one else can access the app), and call blocking. Talkatone handles the basics with ease, and the one-time $10 purchase to remove banner ads is inexpensive compared to some of the subscription models in this list. Its interface is straightforward, modern, and a breeze to navigate. 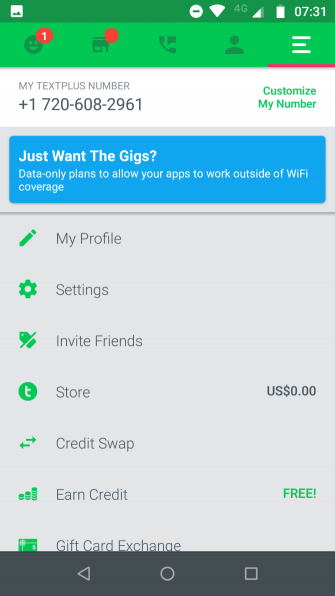 Ultimately, the app is a good place to start if you want to try calling to the US or Canada for free and aren’t really sure what options are available. TextNow also offers free calls and texts to the US and Canada, but with a slightly different design and much more customization. The app has a menu that slides in from the left side, and you can change the theme’s colors to match your needs. It even lets you sync your texts with your computer; this is a huge bonus when compared to the other apps on this list. TextNow used to operate on a subscription model: you had to pay $3 per month to retain your number and access features like voicemail and call forwarding. Today, that’s not the case. The app is free to use and lets you make free calls within the United States without restrictions. You can remove the ads if you’re willing to pay. TextNow also lets you call internationally, though you will need to either complete in-app surveys or buy minutes to do this. FreeTone, TextMe Up, and Text Me are all the same app with different color schemes. FreeTone is a seafoam greenish-blue, TextMe Up is light blue, and Text Me is nearly royal blue. They all provide a free phone number for calling and texting. If you download FreeTone and make an account, you’re given a number. If you then download TextMe Up, you’ll automatically be signed in with the same number. They’re all made by the same company, TextMe. We’re not sure why it chose to make three separate apps. Alas, whichever app you end up downloading, they all work well. Calls and texts to the US and Canada are free, but you can purchase credits to call internationally (or earn credits by watching sponsored videos). There’s also a web messenger that you can log into on any device using the built-in QR code scanner. Its ads are more integrated than the easily ignored banner ads of other apps, which is sneaky. It feels like the ads are too mixed in with the content. It costs $2 a month to remove them. TextPlus offers free texts and free inbound calls, but not free outbound calls. Outbound calls within the US cost around $0.02 per minute, or you can watch videos to get free credits if you’d prefer. The interface is separated into five tabs. The first tab provides your balance and lets you earn credits. Oddly, the second seems to closely replicate the first. The other three are your texts, calls, contacts, and settings. In the settings, you can easily change your number for a new one in any US area code. Without free outbound calls to the US and Canada, we can’t see many reasons to choose TextPlus over any of the previous options unless they have cheaper calling rates to a particular country you need to call frequently. For a long time, Dingtone looked dated, which was a shame. The app has some unique features but the interface turned people away. Thankfully, a recent redesign has remedied those problems. Today, it sports a sleek Material Design interface that’s easy to use and navigate. And what about those unique features? We particularly like Callback; Dingtone can ring you and the other person then connect your calls, thus reducing fees. The app also supports adding a second and third number to your other devices. You can have one number for your phone, another for your tablet, and so on. As you would expect, you can also set up voicemail, call forwarding, and call blocking. To make international calls to landlines and cell phones in more than 200 countries, you can earn free credits by watching videos. Unfortunately, calling prices are obscured by the fact that Dingtine doesn’t charge by cents per minute, but instead by credits per minute. This can make it really easy to overspend. Lastly, while the other apps only give you access to US numbers, Dingtone can provide you with a number in the US, Canada, UK, Australia, Belgium, and the Netherlands. As such, for non-US residents, it’s a solid choice. Apps that let you make free phone calls to the US and Canada are just one of the many ways you can communicate for free using your smartphone. If they don’t meet your needs, why not check out some other options? Want to send messages from both your phone and your computer? Grab one of these options to continue the conversation wherever you go!
. Or for something different, have a look at weird free messaging apps. Explore more about: Android Apps, International Call, iOS Apps, Phone Numbers.